Start building your work ready skills today. 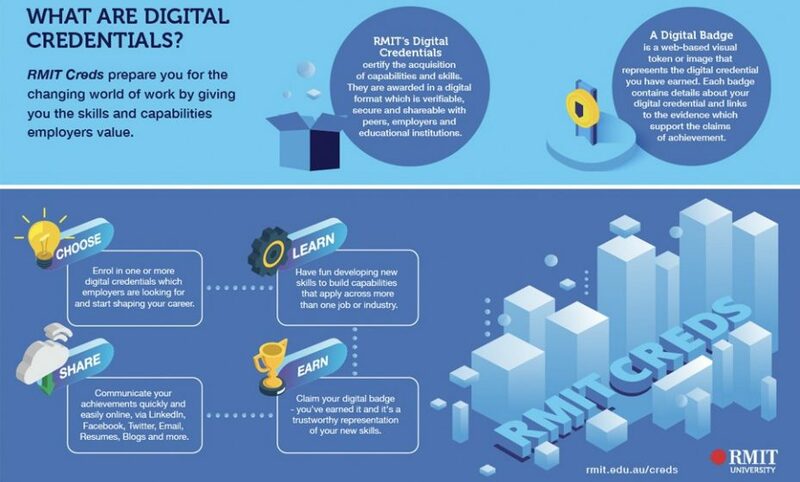 RMIT Creds is a University-wide digital credentials program designed to help our students develop their own skills and experiences, actively preparing them for future life and work. Available to all current RMIT Students, you can choose your learning path to create your own portfolio of professional and personal skills and capabilities. RMIT's Digital Credentials certify the acquisition of capabilities and skills. They are awarded in a digital format which is verifiable, secure and shareable with peers, employers and educational institutions. Click the infographic to expand and learn more about digital credentials and the journey that starts with enrolling in credentials through to communicating your achievements. It’s time to take ownership of your learning by building your very own digital curriculum of industry-validated work skills. Are you ready to create your own version of incredible? Our digital credentials are co-created with industry to ensure they are relevant for a changing workforce, helping our students develop skills and capabilities that are valued by employers and transferable across industries and occupations in Australia and around the world. Our partners include industry bodies, businesses, corporations, not-for-profits and professional associations globally. "The information that was given in the modules was really helpful for self-reflection. The plan really helped me set in motion some skills that I want to work on, and I feel a lot more confident." "I believe that having an online module such as this enables students to re-evaluate their current skills and experiences. A digital badge also gives students the motivation to get involved in these modules and apply what they have learnt in the real world." "Provided great ideas about ways to develop leadership skills in practise - I'll definitely take part in these in the future."